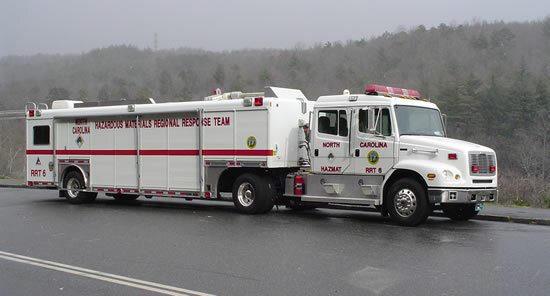 The NC Hazardous Materials Regional Response program is a system of seven teams strategically located in the state to provide hazardous materials response services to the citizens of North Carolina. The RRTs are available to respond whenever an incident exceeds local capabilities with technical support, manpower, specialized equipment and/or supplies. The RRTs are available to supplement local resources when an incident is beyond the first responders' capabilities. Such incidents generally require more sophisticated equipment and hazardous materials technicians who have received a higher level of training. If an incident commander or local emergency management coordinator is on the scene of a spill involving a suspected or known hazardous material, and has a technical question, the local RRT may be contacted by telephone for information on the nature of the material and recommendations for mitigation of the incident. Due to the chemical properties and hazards of the substance, or the potential for exposure to humans or animals, or damage to the environment, the RRT contact may recommend an emergency response by the RRT. If this is agreed on, the incident commander or local emergency management coordinator must contact the State Emergency Operations Center to place a formal request for the RRT. Once on scene, the Regional Response Team works within the existing command structure. The team leader is the primary point of contact with the team. The team provides assistance with mitigating the incident to a point where it has stabilized, and the emergency phase has been terminated. At that point, the Regional Response Team clears the scene.